You probably know that the Russian Sputnik satellite was the first human-made satellite to be placed into orbit. If not, I’m guessing you’ve at least heard of it. While the Russians beat the United States in that first declaration of space dominancy, America wasn’t far behind. 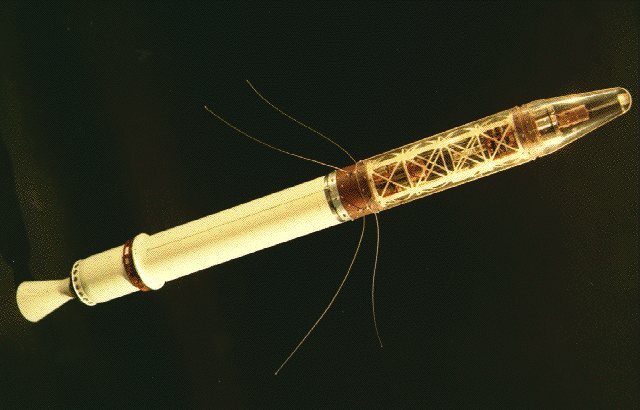 Today we learn the story of the United States’s first orbital satellite: Explorer 1 1. Towards the end of 1957, news of the Russians’ space accomplishments was rocketing around the world. Their successful Sputnik spacecrafts had recorded new entries in world history: Sputnik 1 was the first human-made object put into Earth orbit; and Sputnik 2 carried the first living creature larger than a microbe, a poor dog sacrificed in the name of science, named Laika. The United States’s credibility was in question. Could the US compare to the Russia’s space prowess? News of Sputnik’s milestones kickstarted an otherwise stalled United States space satellite program. The United States Army Ballistic Missile Agency (ABMA), directed by Wernher von Braun, teamed up with the federally-funded research facility, JPL (Jet Propulsion Laboratory) under the direction of Dr. William H. Pickering. JPL designed the Explorer 1 craft, while the ABMA modified one of its Jupiter-C rockets (gaining the designation Juno 1) to carry Explorer 1 payload into orbit. A few months prior, in December of 1957, the United States Navy had attempted to put the first US satellite in orbit. That rocket made it about four feet above the launchpad before failing catastrophically in a magnificent ball of fire. Its failure earned such laughable nicknames as: Flopnik, Stayputnik, Oopsnik, and my favorite, Kaputnik. Rapid work began on the satellite and launch system, and in only 84 days they had completed the design, construction, and assembly of Explorer 1 and its complementary rocket. Explorer 1 consisted of two major components: the 37.25 inch scientific portion, containing science and communication instruments, mated to a 45.5 inch rocket booster. This package was placed atop the 70-foot-tall Juno 1: a four-stage, Redstone-family booster rocket. Explorer 1 launched from Cape Canaveral, Florida, at 10:48pm local time on January 31, 1958. The satellite entered an eccentric orbit around Earth, with the closest point in its orbit at 358 kilometers (222 miles) and its furthest at 2,550 kilometers (1,580 miles). It completed an orbit every 114.8 minutes. Mercury batteries powered the craft’s high-power transmitter for 31 days, with the low-power transmitter operational for 105 days. Explorer 1’s final transmission was received on May 23, 1958. The silent Explorer 1 continued to orbit for more than 12 years, its orbit finally decaying to the point of re-entry and destruction in the atmosphere over the Pacific on March 31, 1970. By then, it had completed more than 58,000 orbits. Explorer 1 effectively initiated the Cold War space race. But it did more than just prove that the United States could compete with the Russians in putting things in orbit. Explorer 1 conducted real science and made some important discoveries that would be important to understand as the world progressed into a space-faring society. Explorer 1 contained two main scientific instruments: one for detecting cosmic rays, and another for studying micrometeorites. The micrometeorite package consisted of a “wire grid (arrayed around the aft section of the rocket body) and an acoustic detector (placed in contact with the midsection)“. Over the course of the experiment, 145 micrometeorite hits were detected. The cosmic ray detection equipment made even greater discoveries. This was accomplished by an “Anton 314 omnidirectional Geiger tube detector“, which measured the flux of charged particles hitting the detector. The experiment was overseen by Prof. James A. Van Allen. A peculiarity was noted in this experiment: the expected radiation count was approximately 30 per second, but the detector would occasionally return a result of zero. It was determined that these zero count intervals coincided with altitudes greater than 2,000 kilometers (1,200 miles). Further research determined that at those altitudes, the detector was actually being over-saturated and overwhelmed by the radiation. This led to the discovery of an energetic belt of charged particles that surround magnetized planets , such as Earth. This belt was named after James Van Allen, and today are known as Van Allen radiation belts. Knowledge of this region would become essential to the survival of humans that would travel through them in later space programs. The discovery was designated as one of the greatest of the International Geophysical Year. At around 1:00 am on February 1, 1958, just hours after Explorer 1’s successful orbit insertion was verified, William Hayward Pickering, James Van Allen, and Wernher von Braun were ushered to the National Academy of Sciences building in Washington, D.C. to conduct a press conference that would make headlines around the globe. That press conference produced one of the most iconic images of the Space Age. 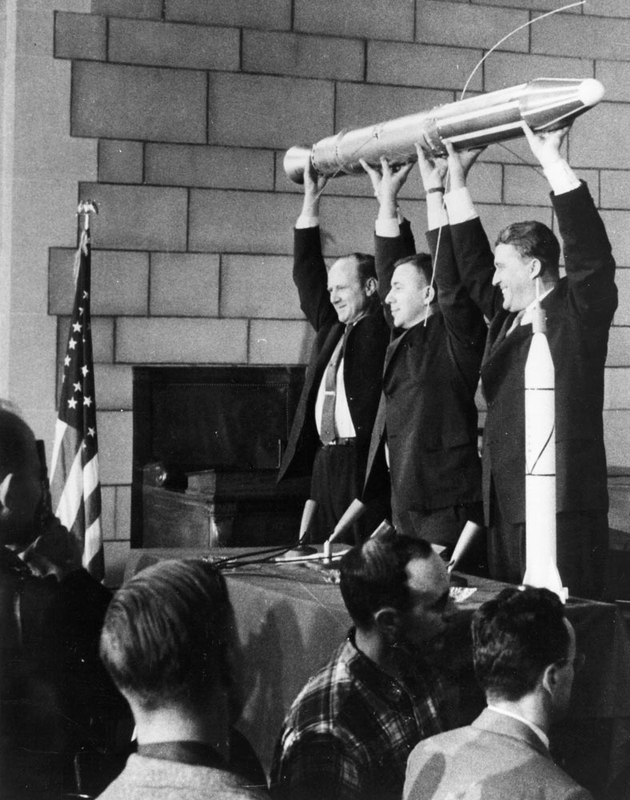 In the image, Pickering, Van Allen, and von Braun stand triumphantly, holding a model of Explorer 1 high above their heads. A Moment in Time: Explorer 1 – Each of these three men thus represented a component of Explorer 1’s success: the rocket, the satellite and the science payload. Each represented an institutional underpinning crucial to the fledgling American space program: the Army, the Jet Propulsion Laboratory and scientific research as represented by the University of Iowa. Each had converged from his own path to the singular moment depicted in the triumphal image. The success of Explorer 1 can’t be overstated. It proved the efficiency that could be achieved through collaboration between civilian and military agencies, it was one of the major sparks that ignited the Cold War space race, and it confirmed the United States as a powerful contender to the Russians.